My Blue Boat My Blue Boat was the last book of the school year, preschool, and our BFIAR journey. It was bittersweet. Although, we were happy to embrace our summer vacation, we were sad to end this chapter of our homeschool experience. Looking back, we enjoyed our time together and savored each lesson we’ve learned. Those are memories we will hold dear forever! With all that said, we were ready to set sail on our last row! I created a printable pack for this book. You can purchase it here! I laminated the vocabulary cards and added them to our Sensory Story Box. We were ready to set sail on our last BFIAR adventure! We began rowing My Blue Boat on a sweet note! The kids created their cover pages and we were all set to row! We chose to memorize Psalm 107:23-24. 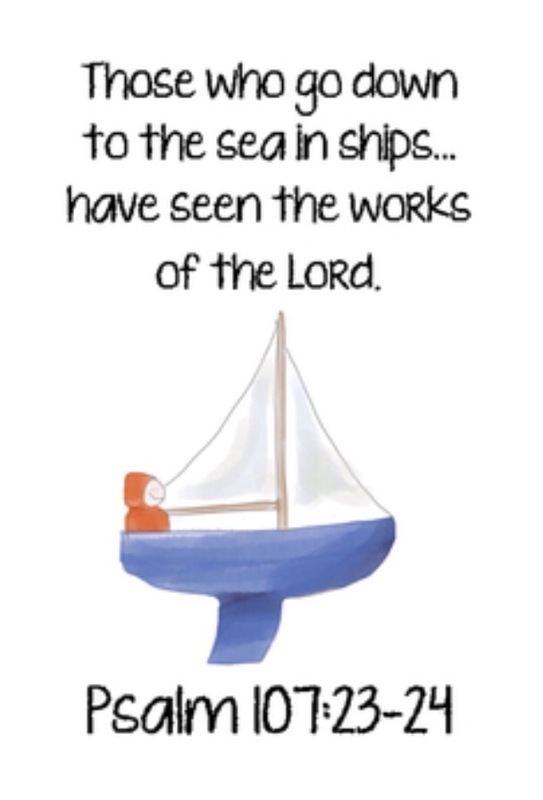 I created a Bible verse printable for this book. You can grab your FREE copy here! All three kids completed their Bible verse tracer worksheets. Parker continued to work on his memory verse puzzle throughout this row. We studied the story of creation using adorable printables from Lavinia Pop (In My World). We used her Creation booklet and started off our lessons about creation with a bang…GOD’S way!!! We went into the dark closet with a flash light. In the dark, I started with “in the beginning God said, ‘let there be light! '” and I turned on our flashlight. The oohs and ahhhs and giggles of excitement followed. They LOVED it! Afterwards, the kids took turns sorting the pictures of “day” and “night”. The next day we ate a ” sky and sea” (hot cereal with whipped cream and bananas representing the sky above and blue frosting and blueberries representing the waters below) breakfast as we read about the second day of creation. The kids sorted sky and land items in our sensory baskets. Afterwards they worked on their worksheets. I also set up a Land, Water, and Air Sorting activity (The Helpful Garden) on Learning Lane. This was the sorting activity and handout for the third day of creation. We read Our Stars by Anne Rockwell and I printed some star themed worksheets for the kids to work on. Parker worked a connect-the-dots and single-digit equations while Jordan worked on double-digit equations. We read how God created the sun, moon, and stars on the fourth day. The kids colored and added the worksheets to their creation booklet. We read how God created the birds of the air and sea creatures on the fifth day. I set out two blue trays with foam dough, white for the clouds and blue for the sea. The kids sorted our animals by “birds of the air” and “creatures of the sea”. We read how God created the animals and Adam on the sixth day. The kids took turns sorting our “animals” into “people”, “animals”, and “insects”. I printed, laminated, and placed all the vocabulary cards (with matching items) in our Sensory Story Box. It’s an invitation to learn AND play! Parker dug into our Sensory Story Box! He began matching items to the vocabulary cards. Near the end of this unit, Parker was able to read and match all the vocabulary words. The kids worked on their tracer pages too (included in the My Blue Boat pack)! 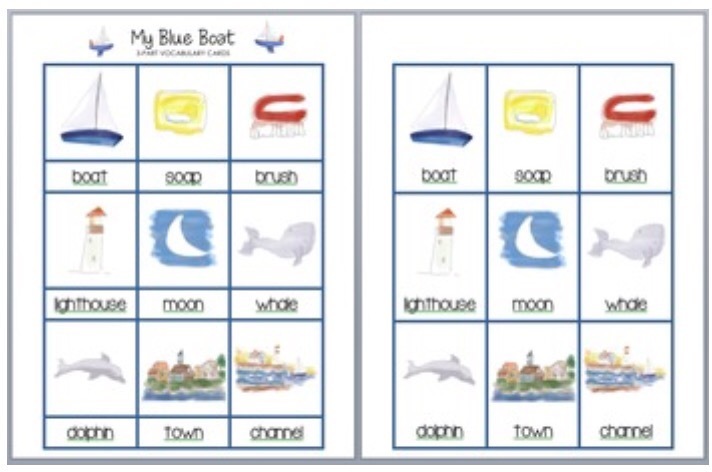 I included a few phonics activities in our My Blue Boat pack. Parker marked the letter that made each starting sound on the card. Parker placed the letter with the starting sound on each picture. I brought out our Montessori blue set of spelling picture cards (The Helpful Garden) and matching letter tiles. I set up a mystery word basket. Parker opened each box, emptied the letter tiles, figured out which word they spelled, and built the word with the tiles. He figured out most of the mystery words on his own! We included several math activities in our My Blue Boat pack and created several FREEbies too! I added our My Blue Boat Shadow Match to our learning lane. Parker matched the pictures to their silhouettes. Click here to download your FREE copy today! The boys worked on both versions of “Which One Is Different” (included in the My Blue Boat pack). I brought out our Sea counters and a wooden box with numbers in each slot. Parker added the matching number of sea creatures in each numbered slot. Parker also worked on the Roll and Count Ocean activity (Homeschool Creations) on Learning Lane. We read Going for a Sea Bath Going For a Sea Bath and counted various sea creatures throughout this whimsical story. I created a Going for a Sea Bath Math Pack to pair with this story. The kids cut out their sea creatures and used them to solve their math questions. Each child had a different version based on their math skill set. Parker counted, totalled, and solved basic questions. I made My Blue Boat Math Worksheets for the kids to work on. Haley worked on triple digit equations (not shown) and Jordan worked on double digit equations. Parker worked on single digit equations. Parker worked on his My Blue Boat color by math word worksheet. Jordan worked on his Color by Math Equation worksheet. I brought out our yellow ball equations and yellow ball play dough. I rolled out balls and Parker smashed them to solve each equation. Parker placed them in descending order (largest to smallest). Parker worked on the My Blue Boat sorting activity on Learning Lane. I added our My Blue Boat pattern activity to Learning Lane. Parker completed the patterns and labeled the type of pattern too. We read about beaches and oceans and identified all the animals in our books. We brought out our Habitat Books along with the My Blue Boat Go-Along-Animals. The kids colored the animals and glued them to their ocean page. 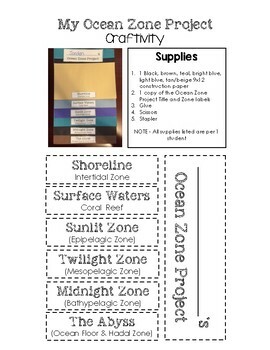 I printed our Ocean Zone project, created our layers of the ocean construction paper chart, and cut apart our ocean labels. We brought out our special 3-D%20Explorer: Oceans: A Journey from the Surface to the Seafloor 3D Explorer: Oceans book from the Monterey Bay Aquarium. We started our ocean zone journey on the shore learning about the beach, tide pools, sea glass, and more. The kids sketched pictures of shells, crabs, and other cool things you might find on the shore. We read about tide pools and the creatures that call the shoreline home. We couldn’t study the beach without reading through Jim Arnosky’s Beachcombing: Exploring the Seashore Beachcombing(our favorite Shoreline book). The kids sketched various shells and animals inspired by Arnosky’s artwork. We headed outside to play in our sand table. It’s the next best thing to the beach, right? After beach combing, we were ready to launch into the great blue ocean. We read about seasons, migration, and the beauty of the ocean. Since we can’t sail the ocean without a boat, we dedicated an entire day to read, study, and experiment with boats…anchors away! We read Boats%20(Picture Puffins) Boatsby Anne Rockwell and Boat%20Book Boat Book by Gail Gibbons. 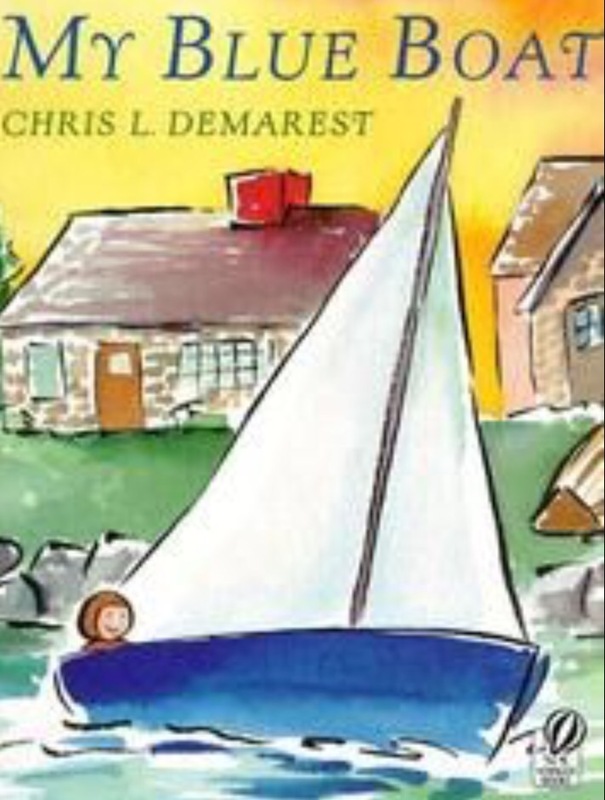 And MANY books about little boys with boats. We even ate little sandwich boats (with Swiss cheese sails) for lunch. We reviewed the parts of a boat using our Label the Boat worksheet. Then we added some boat themed materials to our lapbooks (My Blue Boat lapbook). We did a fun sink-the-boat experiment we found online. First we read Floating and Sinking and the kids made foil boats. They had to estimate how many pennies it would take to sink their boat. Hoping their boats were sea worthy (and floated), they counted the pennies it took to sink their vessels. Parker was the closest! We got our feet wet with a few Estuary read-alouds. The surface waters are brimming with life! The ocean is an AMAZING display of God’s handiwork. We read all about the coral reef and the surface waters. I’m in awe when I study the colors, variety, and uniqueness of each sea creature. My Visit to the Aquarium (Trophy Picture Books (Paperback)) Visit to the Aquariumby Aliki is one of our favorites! It gives you a GREAT variety of ocean life…it’s ALMOST like visiting the Monterey Bay Aquarium. The kids LOVE sketching the animals while I read. They grab some of their favorite books and sketch using the illustrations as inspiration! Their charts are starting to fill out! They really look forward to this CRAFTivity every year! Who eats what in the waters below? We read Jim Arnosky’s Gobble%20It Up! A Fun Song About Eating! Gobble It Up! book. It’s a fun resource to teach how different animals eat. I set out an invitation to ocean play tray with blue, green, and purple Play-doh, gems, foam ocean plant life, and our Toob ocean packs. Haley made what looks like a shark feeding frenzy! And a beautiful coral reef scene. Jordan has his baby turtle and what looks like a masterpiece in the making. He created a fantastic ocean scene FULL of wonderful surprises! We dove a little deeper as we navigated the open waters. We read Bottlenose Dolphin Up Close (Whales and Dolphins Up Close) Bottlenose Dolphins Up Close. We brought out a balloon to mimic the sound of bottlenose dolphins. This was a HUGE hit! Everyone took a turn squeaking! We added some dolphin inserts into our lapbooks. As we dove further down into the blue waters, we discovered many whales. We read Blue%20Whales Up Close (Whales and Dolphins Up Close) (First Facts) Blue Whales Up Close and Big%20Blue Whale: Read and Wonder Big Blue Whale to learn more about this gentle giant of the ocean. We even added a whale mouth and baleen to the top of our strainer and scooped up water beads as a demonstration. We also read some fun stories about whales. The kids drew a whale using an art tutorial (Art for Kids Hub) on our My Blue Boat playlist. I handed everyone a copy of our Label the Blue Whale worksheet. The kids colored and labeled their worksheet and we glued them into our lapbooks. Each year we dive down deep into the twilight, midnight, and abyssal zones, because Haley has always been fascinated by the strange and mysterious creatures that live there. We read The Magic School Bus on the Ocean Floor The Magic School Bus On the Ocean Floor and Gail Gibbons’ Exploring the deep, dark sea Exploring the Deep Dark Sea. The kids sketched some of these eerie creatures of the deep. I love how Haley recreated the abyssal zone when we did our play-doh ocean scenes. We opened our book to a beautiful ocean scene, brought out our charcoal pencil set, our oil pastels, and watercolor sets. First the kids sketched the scene with their charcoal pencils. Then they added details with oil pastels and Haley used her Sakura XBR-12SA 12-Piece Koi Assorted Coloring Brush Pen Set Koi Watercolor pens. They painted the rest of their scenes with watercolors. I decided to do a fun blue Lil’ Color Lab since the color is in the title and beautifully illustrated in SO many hues. I put together a “blue” basket with blue filler, several shades of pom-poms, feathers, and various toys/objects. I also included blue colored letters that spelled “blue”! Parker went to work right away as he spelled “blue” and started picking out the blue items. He decided to organize the objects from darkest to lightest shades of blue. Both Jordan and Haley took a turn working through our color lab! We had such a fabulous time rowing My Blue Boat! We learned about the importance of keeping our bodies clean. Then we read more fun bath themed books. Rub-a-Dub Dub, baths are SO much fun! It was Parker’s last day of preschool. I made him a felt blue boatand decorated the table in the playroom. Today was bittersweet. We were saying goodbye to preschool, but we truly enjoyed the past two years with BFIAR. We made so many wonderful memories that we’ll cherish FOREVER! We put together a My Blue Boat playmix to use during this row. It’s a great mix of songs, read-alouds, science clips, and SO MUCH MORE! 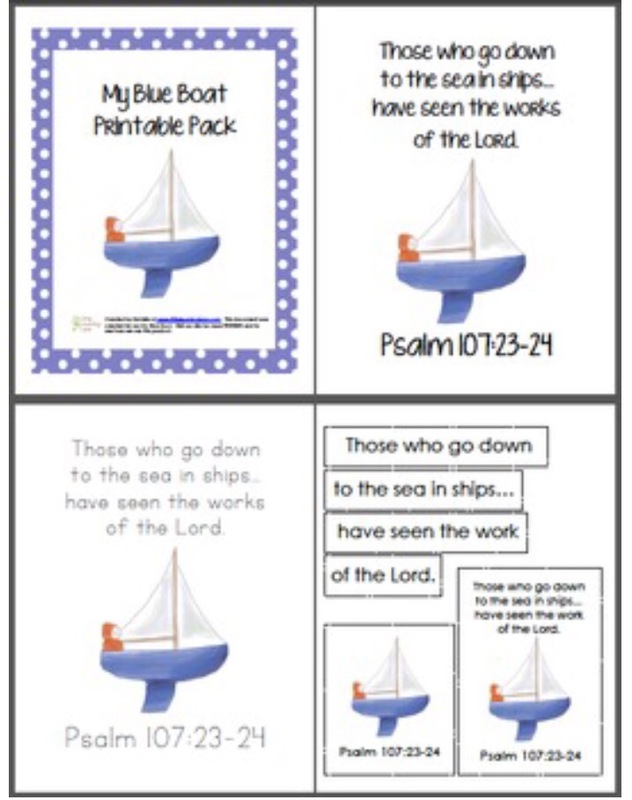 Most of the activities and printables we used during this row can be found on our My Blue Boat pinterest board. Though we were sad to end our BFIAR journey, we look forward to starting FIAR in the fall! Until then, have a happy summer!